As fall arrives, and the holidays are just a short few months away, red berries in the garden start to look like a great idea. There must be a million pictures out there of holly berries and snow, it is such an iconic Christmas image, but it remains an attractive and enduring one. That splash of red not only lifts the garden, but it makes wonderful wreaths for the door, or fills vases with brightness for the house. Holly bushes are widely used for hedges and screens, but let’s focus on them as sources of winter color, with those brilliant berries crowding the branches. Most hollies are evergreen, with glossy, deep-green leaves and spiny tips, but there is a deciduous shrub that grows wild across a lot of the country that is less well-known, and rarely seen as a holly. This is the Winterberry, which grows all through the east, from Newfoundland in Canada, south as far as Alabama. Although it is usually found in damp places, it will grow in any garden soil that is not too dry, so it’s a great choice if you have wet spots in your garden. It grows into a bushy plant about 6 feet tall, with green leaves, but no spines. In fall the leaves turn yellow and drop to the ground, suddenly revealing clusters of bright red berries all along the stems. These last for weeks and weeks in the garden, or they can be cut for winter decoration in the house. This easy to grow plant deserves a place in every garden, but especially in colder regions. Unlike evergreen hollies, which rarely survive without significant damage in areas colder than zones 6 or 7, the Winterberry is hardy right into zone 3 – but also thrives all the way to zone 9 – so no matter where you live, this plant will grow easily for you. It is always best to grow an improved, cultivated form of a wild plant, and the best Winterberry to grow is the Berry Heavy Winterberry (Ilex verticillata ‘Spravy’), which is sure to have a big, heavy crop of extra-large berries every year. While many evergreen holly bushes will produce berries, some are much more reliable, with heavier crops, so if your goal is berries as well as screening, it makes sense to choose one of these. A top choice for berries is the Castle Spire Blue Holly (Ilex x meserveae ‘Heckenfee’). This great shrub has a natural upright form, making an elegant pyramid without any trimming needed. It only grows to 8 or 10 feet tall, so it fits perfectly into a smaller garden. As winter arrives it will be smothered in clusters of large red berries, and with its classic, deep-green leaves it cuts beautifully for wreaths on the door. Wait, that is not all. If you live in zone 5, this hybrid holly has been specially bred for your region – a whole zone colder than where most hollies thrive. So for a holly that is both rich in berries, and cold-resistant too, you can’t beat this one. Another great evergreen holly choice for colder areas is the Red Beauty Holly. As the name accurately predicts, this rugged plant is smothered in berries for months at a time, yet it needs no special care, and it is hardy throughout zone 5. A recent hybrid, carefully bred for hardiness, density and bountiful crops of berries, this plant is correctly known as ‘Rutzan’. That is not a very exciting name, but when shopping for this tree, check that you are really buying ‘Rutzan’, or you will be disappointed. There is one thing that causes a lot of confusion about hollies, and leads to gardeners saying they can’t get berries. This is the issue of pollination. 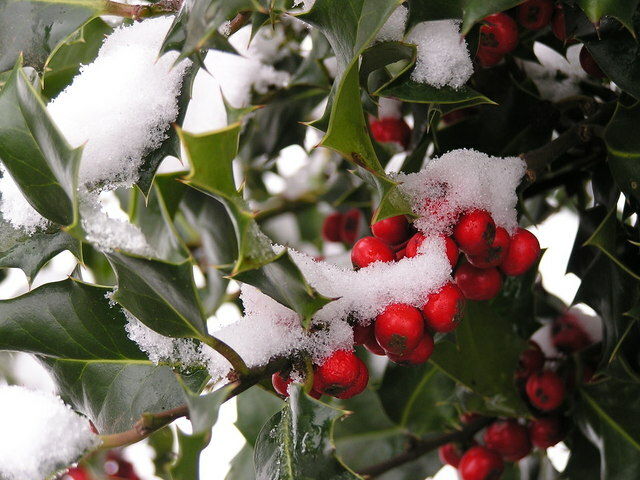 Holly bushes are unusual, because they come in guys and gals – that is to say, separate male and female trees. As might be expected, only female trees have berries, and mostly they need a male tree for pollination, to develop a full crop. Since males don’t have berries – obviously – they are only useful for screening, but still, you only need one for several female trees, as many as 8, or even more. It is easy to slip a male or two into your planting, especially in a hedge or screen, and you will really notice the difference in the berry crop. Males will often pollinate lots of different types of female hollies (sounds like a familiar story! ), but ideally they should be closely related. If you grow the terrific Castle Spire Blue Holly, it has the perfect male companion in the Castle Wall Blue Holly, called ‘Heckenstar’. This is also an excellent hedge or screening plant, so well worth growing for its rugged hardiness and attractive evergreen foliage. For the Winterberry too, it is best to have a male tree or two around. Often trees in neighboring gardens will do the job, so see what is growing around you. If all this sounds a bit tricky, there is an easy solution. The Oak Leaf Holly (Ilex ‘Conaf’) is a female that is happy on her own. This beautiful holly, which can reach 15 or even 20 feet if left untrimmed, is guaranteed to produce a bumper crop of berries all by itself. If you have limited space, and just want one holly, this has got to be your best choice – beautiful evergreen foliage and bright red berries from a single plant. There is one thing to consider if you want a bumper crop of berries on your holly bushes. If you are planning to trim them, timing is important. Holly trees flower in spring, but the small white flowers are inconspicuous, and may pass completely unnoticed. The small, green developing berries are also easy to miss. If you trim your trees in late spring or early summer, you may accidently trim away many of those immature berries, and then wonder why, in fall, you have so few. The best time to trim, if you want a big crop of berries, is in late winter, before flowering starts, or even better, in early fall, when you can easily see which branches have berries, and leave them be. A second light trim in late winter will tidy up any branches that you left for the berries. Alternatively, you can trim hard every second or third year, and sacrifice berries for that year. You will get bumper crops in the years you don’t trim, and still have neat bushes for your garden. Whatever varieties you choose, and however you grow them, you will enjoy the winter beauty of holly berries in your garden, and find them a great way to have branches to decorate your home for the holiday season. As winter goes on, the birds will finally move in and eat what is left, so you will be helping local wildlife as well – sounds like a perfect world.